In July, I packed my comfy sandals, tucked in my summer wear and went to Atlanta for the Romance Writers of America national conference. The first thing you might wonder is, “what’s a horror and suspense gal doing in a place like that.” Though I’d joined the national organization and Kiss of Death (KOD) chapter and participated in some KOD courses, I wondered the same thing. I found myself looking around as I crossed the hotel’s threshold and then again at the registration counter when picking up my badge. Would a warning siren go off? Warning warning woman who writes about serial kidnappers is in the halls. Beware and on the lookout for the lady who has a budding love story involving workers for a hit family. Would they taser me, drag me into a back conference room and make me listen to Justin Bieber and New Kids on the Block love songs while memorizing passages from “The Thorn Birds”? Don’t Just Join, Be Active – Belonging to a group of organizations might look good for the resume, but it doesn’t lead to any sense of community. People won’t know that you’re there. To overcome the massive feel of large groups, start small. If there are smaller local chapters or online groups of interest, seek them out. If there is an online forum, introduce yourself. If someone asks a question you can answer, answer it. If you need feedback on an area, poll the group. You don’t have to meet everyone. Understand that putting yourself out there to meet someone will lead to another someone, which leads to a growing community of friends. Go in Open Minded – I’ll admit to having a little nudging voice in the back corner of my brain going “who are you kidding, you don’t belong there” and “what if nothing at the conference applies to you.” If you have a vocal inner critic like that, toss it some Godiva chocolate and run the other way. I joined RWA after my friend, California diva extraordinaire Tameri Etherton, shared repeated praises about the opportunities it would bring. I went into the conference with the goals to meet Lisa Gardner (squee! ), learn craft techniques for romantic and paranormal suspense and say hello to at least one person in each session–with no expectation on how doing any of that would flow. Met all the goals and experienced a ton more in between. Everyone Has a Fan Girl Moment – For some, it was during the Literacy Signing. For others, it was at publishing house forums or in the bar. 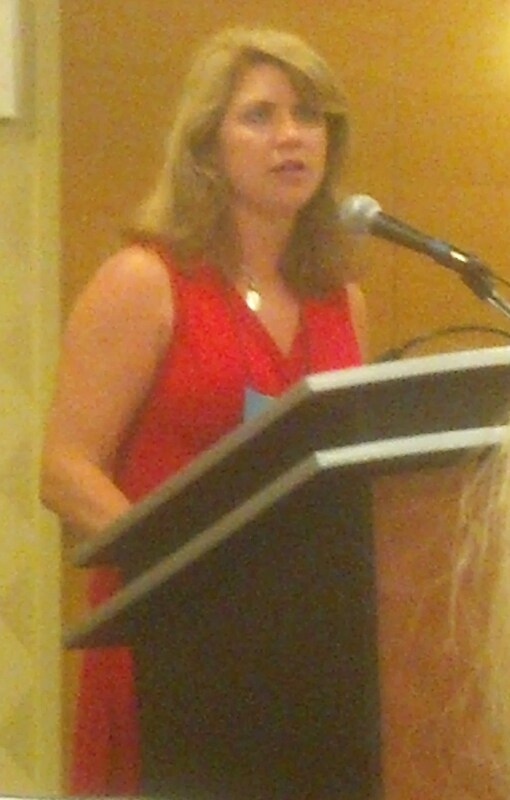 I went all teary-eyed, gushing tongue at Lisa Gardner’s session on writing romantic suspense. It has been building since I read the workshop listing and saw her name. THE Lisa Garder will be in Atlanta, at the conference I’m going to, leading a session I’m attending?! That morning, I sat in the second row trying to simmer down the building crazy squeal. I then spent five minutes fighting the inner critic telling me I couldn’t just walk up and say hello (I even half walked towards her twice before chickening out). Finally, take charge Melinda VanLone walked over to Lisa and told her, “I have a friend who is a huge fan and wants to meet you, but she’s shy.” Egads! I pushed myself over, sputtered a fan-girl hello and swooped in for a hug to stop myself from bawling. Lisa was super sweet, loved that I was a huge fan and then asked me about my writing. I talked to Lisa Gardner about my writing. Life moment met. Pace Yourself – This tip first came to me after I asked the KOD FB forum for advice on how to best approach the conference. They provided the goal to meet at least one new person in each session and to have an idea of what to attend, but stay flexible. Other advice was to take a break if needed, don’t miss the free book signings (book loot!) and to prop up ankles against the bed’s headboard to alleviate swelling. I had a mini-mental meltdown during the first full day of sessions thanks to the yappy inner critic telling me all kinds of negative crud. I squashed her via my plan to make sure to connect with friends at least once a day whether meeting up in a workshop, joining in for lunch/dinner or networking in the lounge. Laughing goes hand-in-hand with learning. You Are Worth the Investment – Yes, there is a cost to becoming a member of RWA (and other national organizations). Yes, there is a cost in registering, traveling to and participating at a conference. Yes, there are some great online writing sites that provide free craft advice or reasonably priced craft classes. The reward for attending in person is priceless. Since I started participating in larger scale writing workshops a few years ago, my craft has risen to another level. It is noticeable to me and others who read my work. The face-to-face contact can also further grow friendships that started online, provide experience in networking and being able to discuss current projects and free you to see new perspectives. RWA 2014 is in San Antonio. Regardless of genre, I encourage you to join RWA, attend and be transformed. What writing conferences and events have you attended this year? Any can’t miss activities you’d like to share? What’s your best fan girl (or guy) moment? This entry was posted in Writing Life and tagged Barbara McDowell, Romance Writers of America, writer, writing, writing conference. Bookmark the permalink. Yes, yes, and yes, Barbara! All of this information smooths the way for anyone considering joining RWA and having concerns about belonging or how to ease into the experience of participating in the amazing national conference. Priceless! Thanks, Patricia! I’ve now joined my local RWA chapter and will go to my first official meeting next month. Little steps at a time. The advice to just say hi and meet one new person is great for those of us with some introvert aspects. You can come away with double digit new contacts without being overwhelmed. Aww! It was so exciting to see you meet Lisa Gardner! Everybody should get to meet their personal heroes. I met mine, Douglas Adams, before he died and am so glad I got the chance. Seize the day! I’m so glad you had a great time and love that you got to meet Lisa Gardner and had a fan girl moment too. Thanks, Kate! Her writing style and content gave me the “permission” that ladies could write the dark stuff too. I grew up reading dark fiction (horror, suspense, edgy thrillers) predominantly by men and had many occasions of people questioning why I wrote what I wrote. Lisa is part of a crop of fantastic female authors who have blown open the doors for the suspense genre. What an awesome post! Took me long enough to get over here, so sorry about that! I had WAY too much fun hanging out with you at the conference. I love reading your view. I think I forget that you get shy because you’re so open and talkative to me! And I’m super happy that Melinda gave you the nudge to talk to Lisa. I saw her book at Target yesterday and had a mini fangirl moment. I just love you so much, my friend. I wish we lived closer so we could hang out all the time! When’s the next conference? Seriously.